So, you’re in San Luis Obispo, and there’s a zombie apocalypse. What do you do? There’s the cautious, boring response—go to the basement of Ross and build an impenetrable fort out of discount, bee-shaped dish squeegees. You could, I suppose, make the responsible decision and crowd into one of the many downtown bars, so you can await the inevitable destruction of the human race by drinking. There’s the slight possibility that when the zombie alarm—a totally real thing—sounds, you’re already standing in fully equipped zombie attack machine. 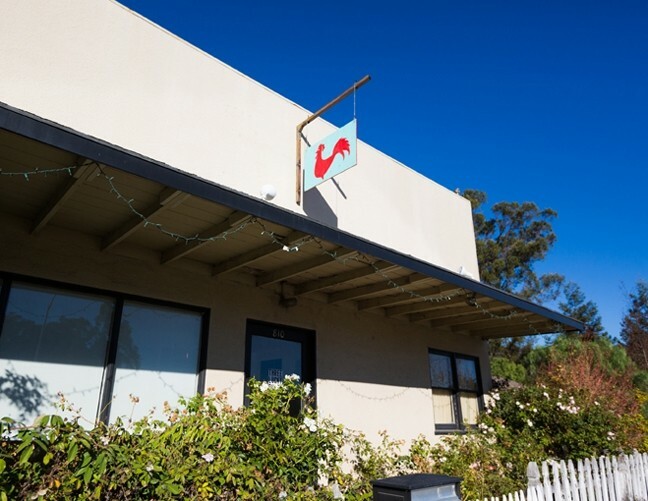 But the coolest place to hide out may be the Bunker—a new art studio in SLO. THE CHICKEN OR THE EGG? : The Bunker hosts around eight local resident artists who do everything from decorate cakes to make prints of superheroes. The Bunker isn’t downtown. In fact, it isn’t even close to the boutique clothes shops, bath goods bazaars, and glass giraffe galleries of downtown. It’s off Broad Street, right across from Bang the Drum Brewery—a funky, new craft brew house that opened in August on Orcutt Road. Outside, there’s no elaborate signage and no lofty pretension. There’s just a modest sign with a chicken and an egg. When you walk in, it’s like a toy store for the creatively inclined and a perhaps a little like an actual toy store. Illustrator extraordinaire, Irene Flores, shares a spot up front with the pop vinyl likes of Thor, Loki, and myriad other characters that can only be rivaled in colorful magnificence by her own prints of Captain America, Sherlock, and Star Trek bosom buddies Kirk and Spock. Flores is far from the only inhabitant of this creative cavalcade. For about a year, there’s been artistic activity at the Bunker space, but it was only recently when more and more local artists began to flock there in the hopes of fostering a unique space for fine, alternative art in the area. 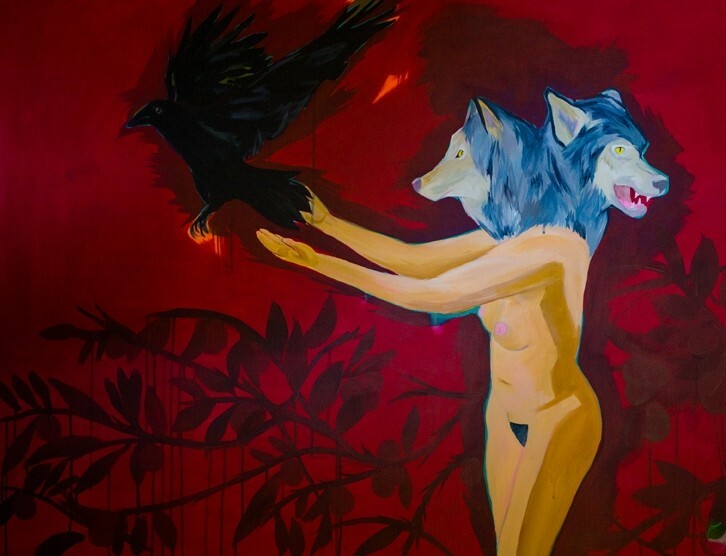 HUNGRY LIKE THE WOLF: Just one of the pieces you can find at the Bunker is Neal Breton’s nudie wolf painting, which has a much more eloquent title ("Saving What’s Left of Me"), but I’m still calling it "Nudie Wolves." And it’s quite a space. During a recent visit, Flores gave us the grand tour and the story behind the name. It’s a short story. They jokingly called it a zombie bunker. Then, they shortened it to just the Bunker. You can’t be wasting extra syllables if there are zombies afoot. It’s an exciting and vibrant place—small, but not stuffy. Outside, there’s a vast backyard that could easily fit at least three bounce houses (nudge, nudge, wink, wink—just a suggestion). Inside, it’s similarly carnivalesque. The Bunker boasts around eight or so resident artists that range in medium and aesthetic from repurposed furniture to high-end cake decorating. Right behind Flores’ figurine dream corner, there’s the boys club of SLO savages Neal Breton, Jeff Claassen, and Bret Brown. Across from them, you can find the eclectic furniture of Jeff Sauer—aka Barn Boy. For years now, he’s been making simple, hardy cupboards, desks, cabinets, and all manner of custom home goods out of old wood. BUNKER DOWN: The Bunker’s Grand Opening party will take place on Dec. 6, from 6 to 10 p.m. It’ll feature all new works from resident artists Neal Breton, Bret Brown, Jeff Claassen, Barn Boy, Irene Flores, Chris Daly, and Jamie Bruzenak, as well as new pieces from featured artists Lena Rushing, Ty Hjortland, and Isaac Wollman. Not to mention, there will be food by Honeybee Cakery, music by DJ Malik, and beer from the neighbors at Bang the Drum. The Bunker is located at 810 Orcutt Road in SLO. For more info, they have a page on Facebook for all you youths to check out. “I always think the pieces I’m building are what some old early American farmer would build for his wife,” he says on his website. Behind Barn Boy and his arsenal of saws, hammers, and barbed wood samples, you’ll find the newest addition to the Bunker collective—Lizabeth Nagel, the proprietor of Honeybee Cakery. Based in Morro Bay, Honeybee Cakery specializes in custom, delicious and decorated desserts. You want a Batman cake with the Joker’s face on top? Honeybee can do that. What about a Mario-themed cake or Angry Birds cupcakes? Oh yeah. Honeybee can do that. Nagel has a penchant for the unusual and exuberant—a quality shared by all the artists at the Bunker. From the naked wolves of Neal Breton to the floral fine art of Jamie Bruzenak, there’s an offbeat, laid-back energy and creative diversity to the Bunker that distinguishes it from the some of the stuffier, please-don’t-get-your-grubby-hands-near-the-piece places downtown. Breton, who previously owned San Luis Art Supply, hopes the Bunker will attract audiences who maybe wouldn’t have walked into an art gallery normally. Jessica Peña thinks she could survive a zombie attack if she had enough cake. Send her cake at jpena@newtimesslo.com.